Last week we escaped to the unique Oregon Coast town of Seaside for a few days. And if the beach itself (three miles long, 250 feet wide) is still too chilly, there are the attractions of downtown Seaside: bumper cars, a carousel, game arcades, mini golf, peddle boats, bicycle surreys, and the Seaside Aquarium. There is a discount mall. And there are crab restaurants, dive bars, ice cream joints, and pizza parlors. The usual beach shops sell rude teeshirts, hats, boogie boards, books, shells, sea glass jewelry, and funny signs about retirement. And the head shop with glass bongs is conveniently right next to a store that sells nothing but munchies. This is Seaside, an old and rough town; the Wild West on the edge of the continent. In 1805, Lewis and Clark finally hit the Pacific Ocean, possibly in Seaside, but nobody knows for sure. Members of the expedition built a saltworks in town (it’s still there) so Seaside in 1990 erected a big bronze statue of the two arriving downtown with their big fluffy Newfy named Seaman. In 1850, Seaside built its first guest house, but the town was barely tamed. The new settlers were still trading furs and beads with the friendly Clatsop tribe. By contrast, in 1850, the older east coast city of Newport, RI was already studded with extravagant 40-room “cottages” where wealthy folk came to summer. In 1906, Portland developer Bud Holladay built Sea Side House, an Italian villa hotel by the sea, touting it as “The oldest fashionable summer resort on the West Coast.” Holladay charged enough to attract a dressy, classy sort of crowd. Everybody else followed: more guest houses, oceanfront hotels, simple motels, and even a towering timeshare. Now the dressy, classy crowd is either diluted or invisible. (Who looks dressy anymore?) Seaside today entertains families of multiple generations, retirees, crowds of teenagers, and people like us who actually enjoy noisy, busy beach towns. (And discount malls!) The architecture here is madly eclectic, from tiny tumbledown cottages in the north to rambling pricey mansions in the south. Downtown there are vestiges of the Wild West alongside curvy Art Deco facades and mid-century blocks. Everywhere there are faded cedar shingles, except where there are buildings painted pink and turquoise. Or just formerly painted and now dripping chips. I love Seaside because of its democracy and infinite variety. There’s never a dull moment, and the nights are full of the sounds of laughter and the scent of the beach fires. There are few quiet moments, but I found one at three in the morning when I went out on the balcony to gaze at the sea. A homeless man with a grocery cart was briskly pushing it down the Promenade, looking not the least bit unhappy. You can’t be unhappy in Seaside. If you show signs or unhappiness, somebody will hand you a giant ice cream cone, put you in a Go-Kart and push. It’s how they roll. This is just your kind of place, ‘wreck! Though no sailboats….the ocean is a tad treacherous. 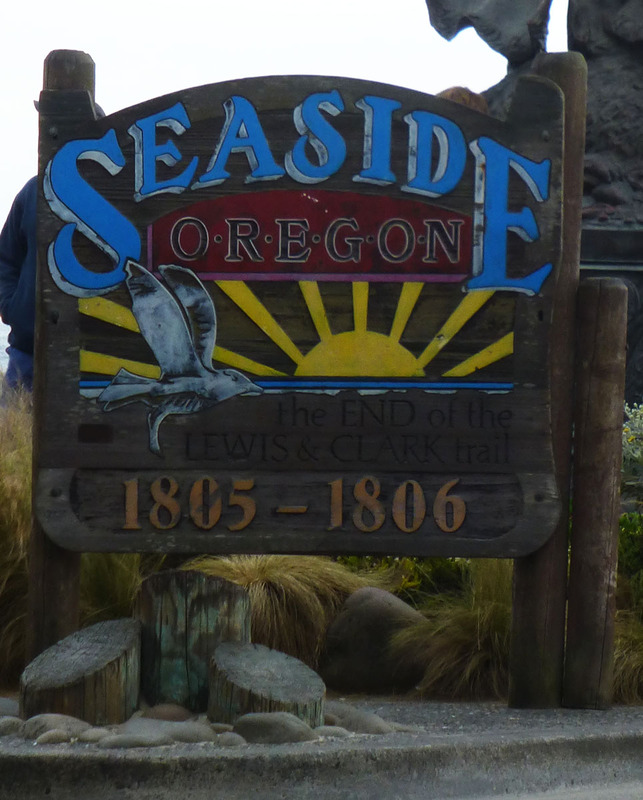 Even though I have never actually been to Seaside, Oregon, I felt that I had just visited it because you so totally captured the atmosphere of the place with your well chosen words and observations. Delightful. Thanks. Aw, thanks Chris! You ought to travel out here before the Big One. Makes me want to visit, now to convince Keith! This has been a remarkable summer at the Oregon coast. If you like warm sand and sunshine, it’s truly the place to be (unless you insist on splashing in the surf, best leave that to Puerto Vallarta). As a native Oregonian, I’m amazed, delighted, and a bit frightened by the coast weather this year. Yes! We’ll meet you in Seaside by the bumper cars!